A Flood Flaps flood vent fits closely into a correspondingly sized vent space in a building wall adjacent a crawlspace under the building. The Flood Flap vents are permanently fixed in the foundation walls of the building at an elevation above ground level. Flood flaps vents are spaced apart around the lower part of a house or other building. The decorative grills on the front of the Flood Flaps vents present a pleasing appearance from the street. The Flood Flaps flood vents are placed in the walls of the crawlspace under a new building under construction, or they are retrofitted into the walls of an existing building once the old vents have been removed. The building may be designed and built with a sealed crawlspace under it, or an existing space under a building can be sealed to form a sealed crawlspace. Flood flaps vents have been found to help maintain a constant temp in the 60’s (degrees Fahrenheit) within the crawlspace. 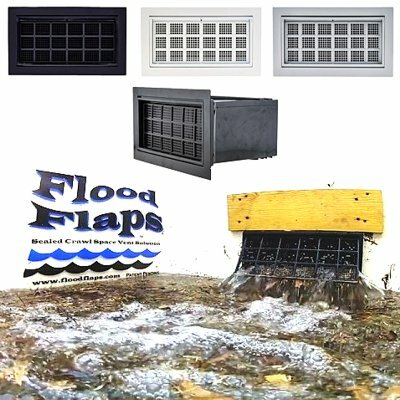 It is believed that Flood Flaps vents help control temperature and therefore heating and air conditioning costs in the home or other building above the crawlspace. Growth of mold, fungus, and mildew is controlled in a sealed crawlspace equipped with Flood Flaps vents and dehumidification, and wood under the building is less likely to rot or be damaged by insects. The Flood Flaps vents largely discourage small animals, such as rats, opossums, cats, raccoons, moles, snakes, lizards, and some insects, from entering the sealed crawlspace. For some applications, such as garage walls where horizontal space is limited, two Flood Flaps vents can be stacked on top of one another in place of two stacked cinder blocks in a wall. Homeowners are sealing/insulating their garages more frequently now, for example, where they are storing furniture, documents, sports equipment, musical instruments, etc. in their garages and therefore want them temperature controlled.